President Trump: "We must never ignore the vile poison of anti-Semitism or those who spread its venomous creed"
US President Donald Trump used part of his State of the Union speech Tuesday night to condemn Iran for its threats to wipe Israel off the map and vowed to battle anti-Semitism in whatever form it took. He also praised Holocaust survivors, World War II veterans and a police officer who saved Jews during the Pittsburgh synagogue shooting last year. “My Administration has acted decisively to confront the world’s leading state sponsor of terror: the radical regime in Iran. In a number of touching moments, President Trump honoured two Holocaust survivors and three American soldiers who liberated Jews in the Holocaust. He also praised a policeman who was shot numerous times saving Jews during the Pittsburgh synagogue shooting last year. “Just months ago, 11 Jewish-Americans were viciously murdered in an anti-semitic attack on the Tree of Life Synagogue in Pittsburgh. SWAT Officer Timothy Matson raced into the gunfire and was shot seven times chasing down the killer. Timothy has just had his 12th surgery — but he made the trip to be here with us tonight. Officer Matson: we are forever grateful for your courage in the face of evil. Lawmakers briefly interrupted the State of the Union to serenade Judah Samet, an 81-year-old Holocaust survivor who also survived October’s Pittsburgh synagogue shooting, with an impromptu version of “Happy Birthday” as the President announced it was Judah’s birthday that day. After they concluded their song, Judah shouted out from the gallery “Thank you” as the President joked “they wouldn’t do that for me”. 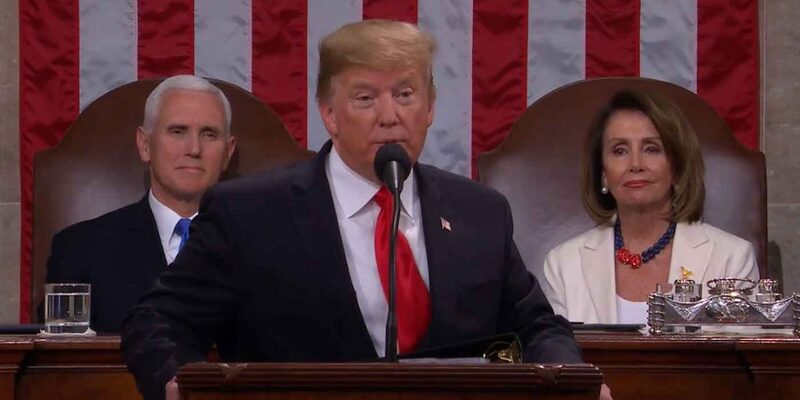 In his speech, which covered a wide range of issues, President Trump also declared the Islamic State militant group all but defeated in Syria. These are all positive points that show President Trump is a friend of Israel and is taking action against radical Islamic forces in the Middle East. The video below is the full speech. The President talks about the above at around 1hr 39mins.